This vehicle has a very interesting history. One of a pair of Leyland Tiger PS1/1's carrying Bellhouse Hartwell C33F bodies, which being new in 1948 and although then only six months old, were purchased second-hand in October 1949 by Delaine of Bourne from Smith of Wigan. 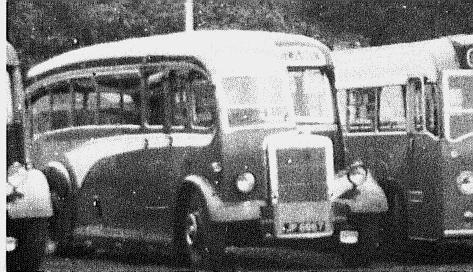 This vehicle No.30 JP 6967 was shown on Smith literature advertising tours, and is seen above with part of a fleet of five single deckers and one double decker needed to convey the village outing from Thurlby to Hunstanton in 1953. The fact that JP 6967 arrived in the Delaine fleet with fleet number 30 on it in Smith's livery, and coinciding with being the thirtieth vehicle in the Delaine fleet, started the use of fleet numbers in the Delaine fleet. The vehicle saw almost eleven years of service with Delaine before being withdrawn and sold to Marfleet of Binbrook in September 1960. After a period of around two years of service with Marfleet's the vehicle was scrapped in 1962.